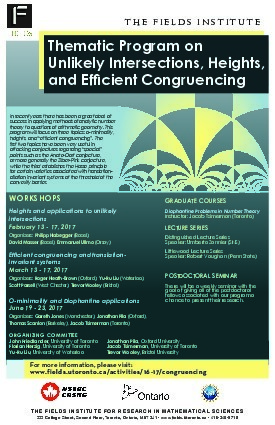 This workshop will focus on the emerging area linking translation invariant Diophantine systems and mean values of exponential sums. In 2010, Wooley devised a new iterative approach to Vinogradov's method of estimating mean values of the one dimensional exponential sums ubiquitous in applications, thereby coming within a whisker of establishing the main conjectures in the subject. In this workshop, we will explore the latest developments in this area, with the goal of fostering interaction between experts of these methods with researchers from interfacing areas such as harmonic analysis, arithmetic geometry, and analytic number theorists in the broader sense. Invited speakers can submit abstracts here.